How Do You Stop A Murderous Elephant Gang? Believe it or not, this was a question that South African officials in the early 2000s had to answer. Young elephant males had formed groups that attacked and killed rhinos for recreation. How could they stop it? The problem was first noticed in the late 1990s and early 2000s, when workers at nature preserves in South Africa began stumbling across the bodies of black rhinos. The horns of the rhinos, coveted by poachers, were still attached, but other than that bodies were rarely in good shape. The sides were punctured, not by bullets or even swords, but by a weapon that was both wide and long. Sometimes the bodies were crushed, as if someone had run over them with a car. The puncture wounds were the telltale sign. An elephant was the culprit, but only a particular type of elephant. When young male elephants reach maturity they either leave or are thrown out of their herd. Sociable by nature, they form all-male herds of their own, usually with one big bull and several "teenagers." The current herds in the nature preserves were different. A cull a few years before had eliminated most of the larger elephants. Rangers began watching herds of young males, and some saw violent behavior develop. It began with a little teasing. A male elephant would spray a rhino with water, or flap his ears at the rhino. Steadily the teasing would escalate. The elephants would make mock charges, real charges, kicks and crushings, and eventually sustained group attacks on rhino herds. Theories as to why these attacks happen vary. Some believe that the cull of elephants traumatized the herd. Elephants have both a societal structure and a memory. 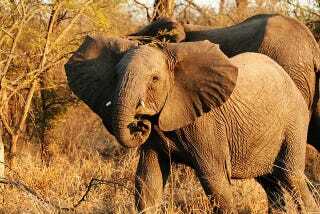 Killing off the big males and the elder females, often in front of their relatives, may have left a strong impression and deprived the younger elephants of a necessary social order. Others believe the young elephants were feeling their oats, looking to spar, and had no big male to take out their aggression on. Still others think that, because of the lack of full-grown bulls, the young males got a chance to mate too early, and their hormones made them aggressive as well as horny. Whatever the cause, researchers were left trying to find a solution. They decided to recreate the demographics of elephant society by importing bulls. Transporting a full grown bull elephant is rarely done. Not only is the scale of a mature male elephant a logistical challenge, the bulls don't take kindly to the process, which involves being chased down and drugged. Nevertheless, it was the only option anyone could think of. As it turned out, it worked. Male elephants curbed their younger counterparts' behavior, sparred with them, and took over the mating duties. The rhino attacks stopped. Image: Professor Lee R Berger.